Are you a resume writer, career coach, or other career industry professional who considers yourself a Master of your trade? Someone who has repeatedly provided the vision, tools, motivation, strategies and expertise to guide clients to success? If you have distinguished yourself in your discipline, be it resume writing, career coaching, career assessment, recruiting, job placement, outplacement, career counseling or human resources, you now have a way to benchmark your advanced level of talent with the Master Career Director (MCD) designation. Designate yourself as the best of the best among your industry peers. Demonstrate your commitment to top performance and lifelong learning. Showcase your contributions and focus on making a difference to both the careers community and your client base. If you have met the criteria, then it is simply a matter of taking the brief time required to assemble the portfolio. 2. Continuing Education: demonstrate a minimum of 36 continuing education units (hours) of industry training in the past 36 months. 1 contact hour of training = 1 CEU; earn CEUs through industry convention attendance, workshops, training, certification programs, teleclasses, and webinars, as well as other CDI-approved programs. Book reviews (1 review = 1 CEU) can account for a maximum of 10 CEUs. 3. Community Outreach: demonstrate a minimum of 22 hours of service in the past 36 months. Earn hours by providing community workshops, speaking engagements and various other pro bono career services and approved outreach efforts. Paid contributions of this nature may count for up to 6 of the 22 hours. 4. Industry Outreach: demonstrate a minimum of 18 hours of industry outreach in the past 36 months. Earn hours through industry-related / program board positions, volunteer committee positions, mentorship and various other industry contributions. Industry programs developed and donated for use by industry associations can count for up to 10 of the 18 hours. 5. Written Expertise: demonstrate written expertise in careers competency with a minimum of three articles (minimum of 500 words each, preferably published but not required) or creation of a workbook, book, manual, e-book, information-only website, software program or other written instructional program (published or unpublished; minimum of 25 pages) within the past 36 months. CDI expert guest blog posts – 1 approved post = 1 article. Published resumes may substitute for one article. 6. Testimonials of Competency: demonstrate ability to translate experience to meet client needs with a minimum of three testimonial or reference letters received during the last 36 months from clients, managers, speaking engagements, etc. 7. Statement of Expertise: communicate your expertise through a 1000+ word philosophy statement which overviews your experience and industry commitment. A resume or bio can also be included. Substitutions: An over-abundance of achievement in #2-5 may substitute for up to 25% of another requirement in #2-5. If you have other industry contributions or achievements that you would like to substitute, please contact us for review and approval. In order to approve the previous criteria it is necessary to prepare a portfolio that can be submitted via mail or email. Documentation is required for each item and should be accompanied by the MCD Reporting Form, which will be provided following registration. (c) Copies of published articles, sample resumes showing the name of publication, or significant documentation as proof of publications such as website where posted, etc. Following your registration, you will be emailed the MCD reporting form for tracking all your CEUs. Once you submit your portfolio, it will be reviewed by the certification committee. Each candidate will be notified in 4-6 weeks regarding the status of submissions. Complete and appropriate portfolio submissions will be awarded the MCD designation, which will be accompanied by a certificate suitable for framing, logo for use in print and web publication, and sample press release for media announcement. Candidates submitting incomplete portfolios will be notified and have a set time to respond with appropriate documentation to fulfill requirements. 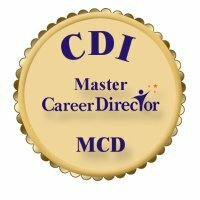 The Master Career Director credential is one of two paths required to attain CDI’s coveted Lifetime Achievement Award. Learn more about this award. The MCD process allow you to take as long as you need within one calendar year of registration. However, it should take a very short amount of time to gather together the required elements as it is primarily an administrative record-keeping process. Please be advised that you must maintain an active CDI membership to complete this certification. Documentation fulfilling items #2-6 from the MCD Criteria List from above. Certificates for credential renewal will be mailed within 4-6 weeks upon successful fulfillment of requirements. Update requirements and active membership are a prerequisite of retaining the MCD credential. CDI reserves the right to revoke this credential if these requirements are not met and maintained. Why is renewal necessary? Because the MCD is built on a practitioner staying up-to-date in both outreach, leadership, and professional development. All requirements of CMRW certification, renewal, and CDI membership standards must be maintained in order to earn or retain a CDI credential. CDI reserves the right to revoke a CARW credential for any of the following: Renewal requirements are not maintained and completed within required timelines. Membership lapses due to non-renewal. Individual is found guilty in a court of law for a grievance within the industry (unprofessional, unethical, unlawful conduct and/or business practices). For more information on the MCD credential contact CDI at info@nullcareerdirectors.com.